NHL defenseman Nate Schmidt; Olympian Gus Kenworthy takes a camera and his skis to southwest Uganda. Joel Rosario atop Orb on his way to winning the 139th running of the Kentucky Derby at Churchill Downs on May 4. Orb will run from the first position in the Preakness, the second leg of the Triple Crown. 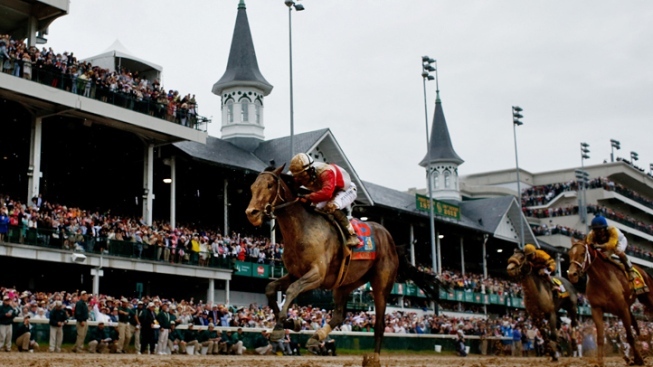 For a while there, it looked as if the Preakness was shaping up to be a runaway victory for Kentucky Derby winner Orb. Then came the post-position draw. Suddenly things got very interesting. Orb's pursuit of the Triple Crown received an unexpected jolt Wednesday when trainer Shug McGaughey's horse drew the rail for Saturday's race. McGaughey tried to brush off the development as a mere inconvenience, but he couldn't entirely mask his disappointment over starting inside eight other horses in the smallest Preakness field since 2007. "Obviously, if I was going to pick it out, I wouldn't have picked the 1," McGaughey said. "But with only nine horses in there to run a mile and three-sixteenths, with a rider like Joel (Rosario), he's going to figure out what to do. He'll have him in the right spot." That's the plan. Yet, if Orb doesn't get in front early, he risks becoming pinned on the rail or pushed to the back of the field. The inside post is even worse in the Derby, where this year there were 19 horses in the field. "If it had come out the 1 in the Derby, you'd almost have felt like you needed to go home," McGaughey said. "But I don't feel that way here." Still, history suggests Orb's advantage in this race has dwindled, even though he was made the even-money favorite in the morning line. Only twice since 1950 has a horse won from the No. 1 post — Bally Ache in 1960 and Tabasco Cat in 1994. So the rest of the field has a little bit more hope than it did before Orb got stuck on the rail. "Out of the nine numbers, the 1 is probably the one you want the least," said Al Stall Jr., the trainer of Departing. Mylute, who will start from the No. 5 post as the second-favorite at 5-1, trailed Orb for much of the race in Kentucky. This race could develop quite differently with Orb inside. "We need to make up three or four lengths, and that may be one of the factors that helps us," said Todd Quast, general manager of GoldMark Farm, co-owner of the Derby's fifth-place finisher. Soon after the draw ended, Mylute jockey Rosie Napravnik said on Twitter, "Perfect draw! super excited! Quast said, "We're ecstatic about it. With this horse, it doesn't matter as much, but it sure is nice being inside, a little bit toward the middle, and then having Orb inside us and Departing inside us, the two big threats. It's great to be outside of them." Departing, a bay gelding, won the Grade III Illinois Derby on April 20 and skipped the Kentucky Derby because Stall did not think the horse was ready. The trainer thinks it might be an advantage at the Preakness. "In this day and age, the modern thoroughbred seems to like a little time in-between races. I don't know why," Stall said. "So we're fortunate enough to have 28 days between the Illinois Derby and now. It gave us time to improve and he really has improved. You can see it on a day-to-day basis when you train him." Stall is among those who believe the rail won't be a hindrance to Orb. "The post doesn't really matter in this type of race, this type of track with a nine-horse field," he said. "It's just a good party to come to." Orb won the Derby by 2½ lengths and has won five straight races, so he's certainly worth of being the favorite in spite of his starting position. "I don't know that the rail's all that bad," said Hall of Fame trainer D. Wayne Lukas, who has three horses in the race: Oxbow, Will Take Charge and Titletown Five. "Orb is still the one to beat." The field, from the rail, with odds in parenthesis: Orb (1-1), Goldencents (8-1), Titletown Five (30-1), Departing (6-1), Mylute (5-1), Oxbow (15-1), Will Take Charge (12-1), Govenor Charlie (12-1) and Itsmyluckyday (10-1). Lukas was delighted with the post positions drawn by his trio of entrants. "I love mine. I thought it was real good," he said. "Oxbow for a change got inside a little bit. He'll be forwardly placed. We shouldn't have any trouble. I'm going to have to come up with a different excuse when we get beat."